Deeper network… 88.9% testing accuracy. No data augmentation yet. After training a network with with two conv/pool layers, a fully connected layer and the output layer, it was quite natural to try deeper architectures. Guillaume and Iulian already managed to get respectively around 85% and 79% of of testing accuracy with 3-4 conv/pooling layers. Following the trend, I tried deeper architectures as well. I first tried 5 conv/pooling layers and obtained a testing score of around 87% after ~100 epochs. Then I tried a network with 6 conv/pooling layers (without zero padding). 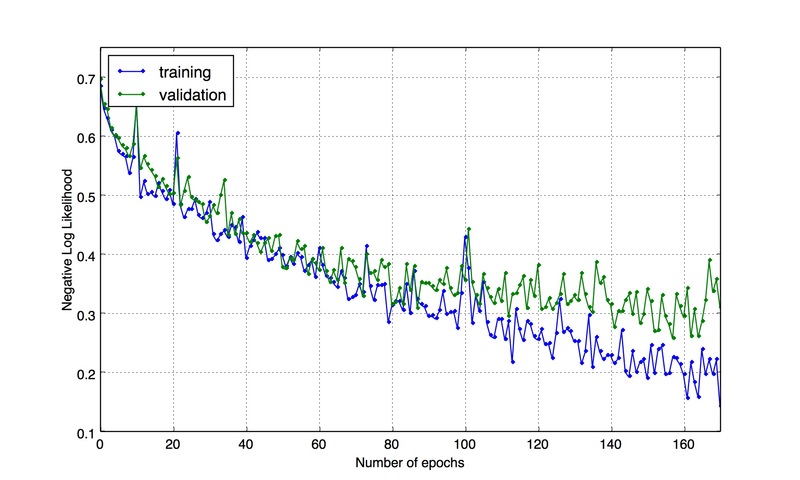 The resulting 8-layer deep architecture reached a testing accuracy of 88.9% after ~170 epochs. Weights were initialized uniformly between -0.1 and 0.1. For a while I was not able to properly train my models due to choosing too small initial weights (the output of the network was always 0.5). I chose input images of 260×260, a bit bigger than the default 221×221 because we should probably keep as much information as possible. There are more and more feature maps as we go deeper to compensate the loss of neurons per feature maps. The size of the representation is always decreasing, starting from 260x260x3 and ending to 256. The first 3 kernels are 5×5 and the last 3 are 4×4. As we go deeper, the neurons have larger receptive fields so we may need smaller kernels. 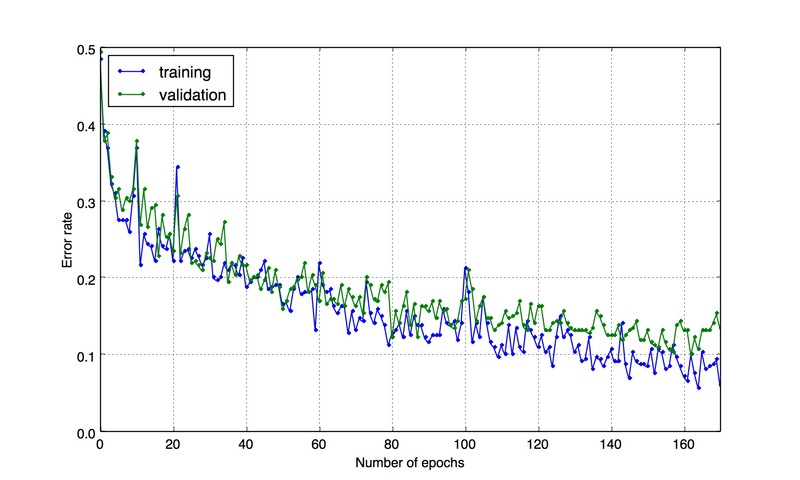 My previous models were not overfitting (not much at least), so I could increase their capacity and it is what I did here: I chose larger feature maps (64, 128, 256) and still the same number of hidden neurons (256). As expected this last model overfits more than my previous models (train error of 0.0598) . I chose a fixed learning rate of 1e-3 but by looking at the jittering of the training error/nll, I think I could have chosen a smaller learning learning rate. Like Guillaume I chose a momentum of 0.1 but I have not tuned it. I was quite surprised to see that Guillaume’s and Iulian’s architecture were quite small (32, 16 and 16 feature maps and a fully connected of only 16 neurons for Guillaume!) but still perform very well. By comparison my architecture is much bigger. May look a bit overpriced! – I will now start working on data augmentation: distort images on the fly (linear and non linear transformations). I will probably evaluate this data augmentation on smaller models to save time. If it improves smaller models, it will likely improve biggers as well. – I might also try even deeper architectures. – I may also start working on rectangular inputs or variable size inputs to exploit more information. Alexandre, congratulations – your results are impressive! No doubt, having a deep network improves performance! I’m also impressed that you manage to train it in so few epochs. Very nice results (and post!) I see that in general people tend to put many conv&pooling layers. Do you know if in general it is recommended to add so many of them and ending up with an output of size 1×1 (as in your case)? If not, maybe it’s a question for the course’s staff.. Yes, it seems that the current trend in computer vision is to have more and more layers (for imagenet14, GoogleNet had 22 layers and Oxford net 19). I wanted to have a large number of conv/pool layers, that’s why I ended up with 1×1. Note that the receptive fields of this layer with 1×1 feature maps are the whole image. thanks for the reply, but i was thinking.. do they pad somehow smart or just slowly loose half size size at each conv+pool? Yes I think all the best imagenet networks (Googlenet, oxford net, Alex net) uses some kind of padding. But I don’t have enough experience to say how much it helps. I had the same issue with network output always being 0.5. Your post was quite helpful.